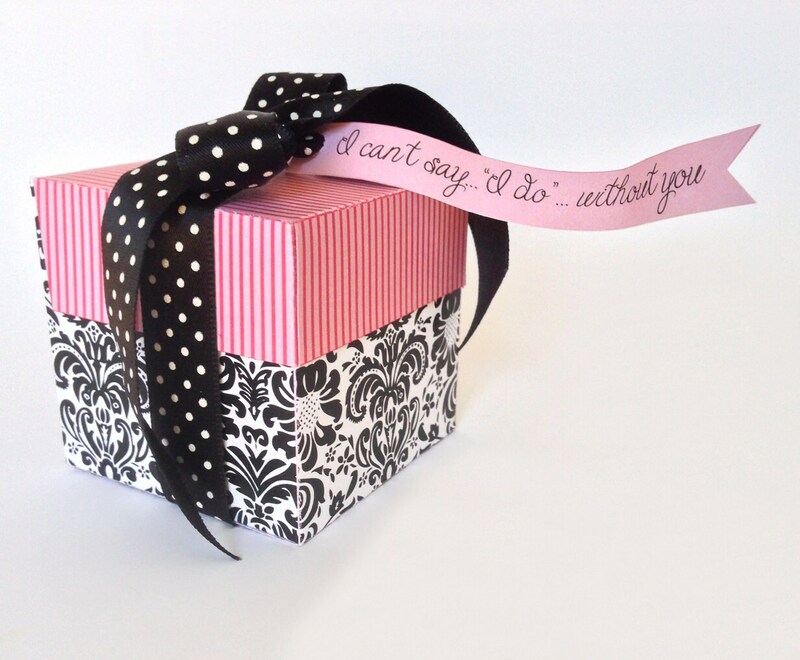 (¸.·´Ask your bridesmaids or maid of honor with this Black Damask Ring Pop Ring box - with PRE-TYPED & PERSONALIZED TEXT on inside labels and outside tags. The kit includes: Bridesmaid Ring Pop Box ★ Ring Holder ★ Pretyped - Inside lid labels ★ EDITABLE - Inside lid labels ★ Pretyped - Outside flags ★ EDITABLE - Outside flags ★ EDITABLE - Name flag ★ Full color step-by-step ★ Full color Step-by-Step Instructions, plus Information for materials need & paper suggestions. When assembled box measures 2.25"w x 2.25"d x 2.25"h x2.25"h.
NOTE: Each printable page fits within an 8.5”x11” letter or A4 paper. 110lb cardstock is recommended. With this kit you may print as many as you need. 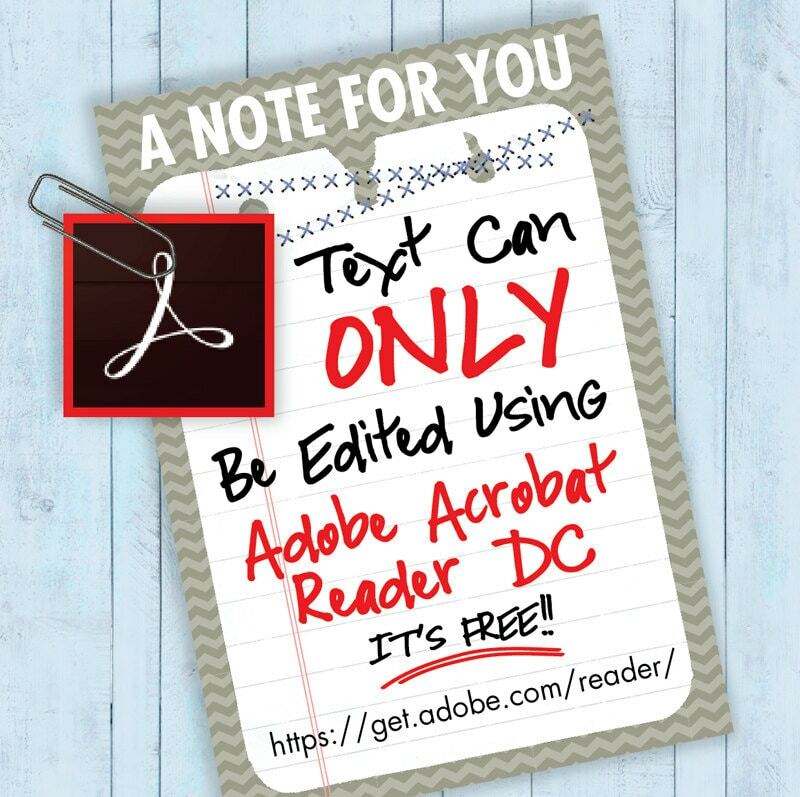 For best results, use the free Adobe Reader. 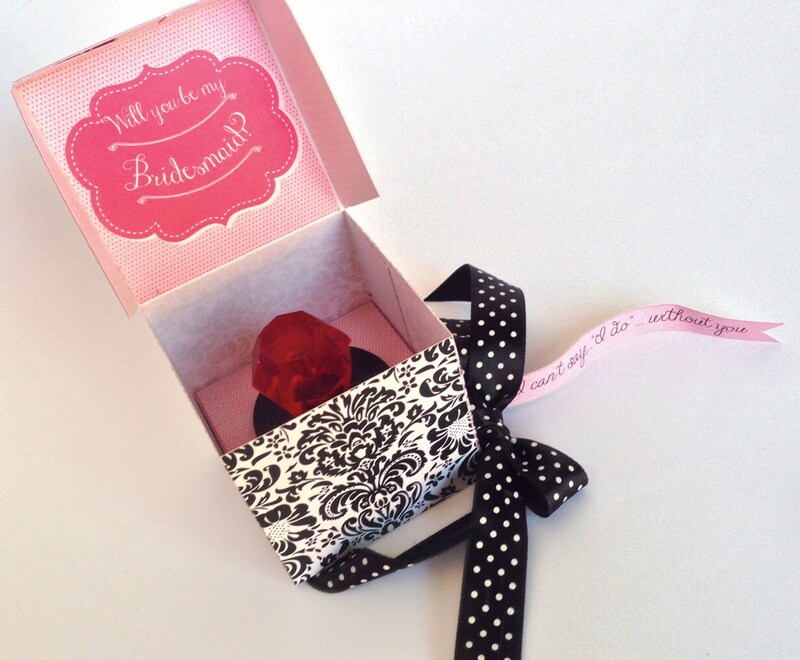 This box is a printable item and does not include the ring pop... it is for photographic purposes only. 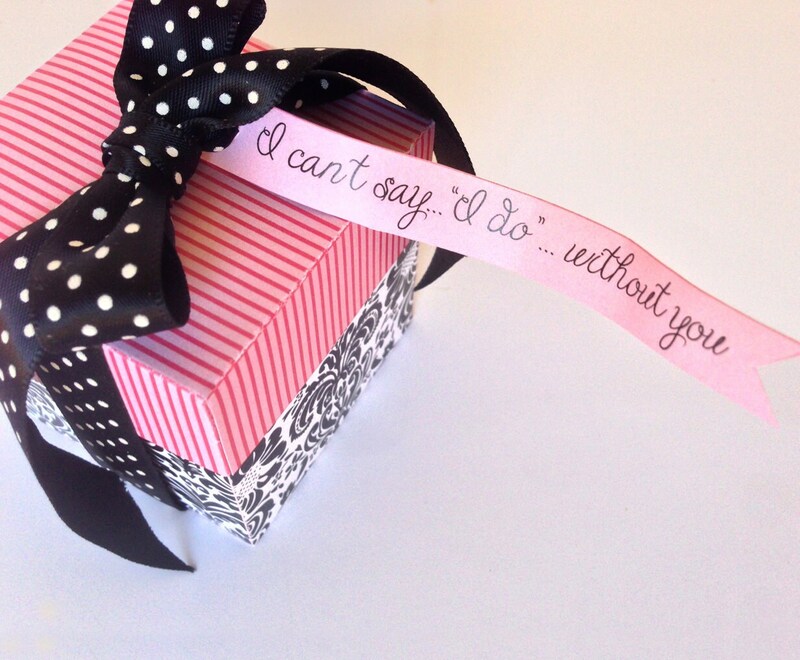 This is a delightful way to ask your bridal court to your share in your special day. You may use the PRE-TYPED outside tag & inside labels or you may choose to PERSONALIZE with the EDITABLE outside tags and labels. 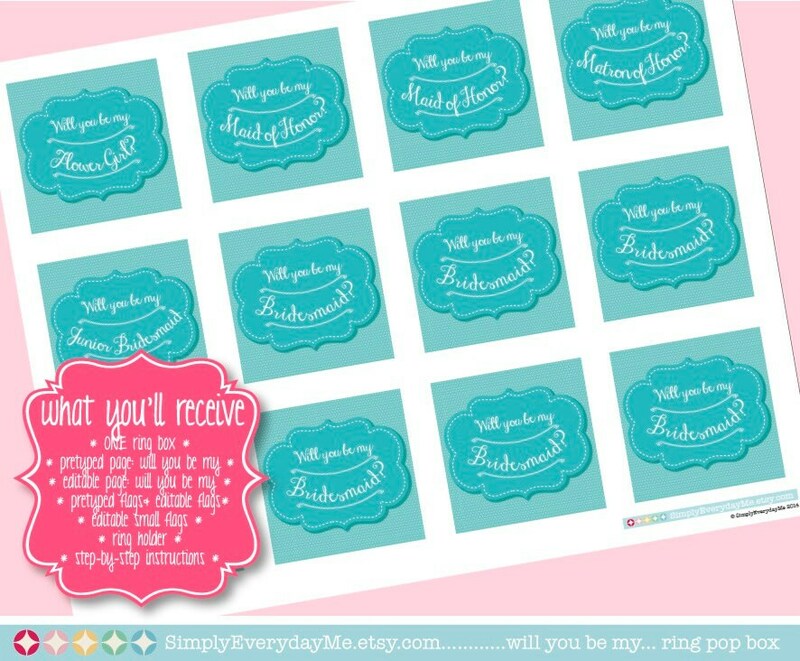 Whichever you choose your court will love the special way you’ve asked them to share your day! This box is SUPER EASY to print.cutout.&create. You will have them done in no time, and ready to ask your bridal court! Absolutely love it! It was easy to put together and I was happy I didn't have to wait for it to be shipped to me. I can do it all myself. Definitely recommend! This was super easy to put together and I did it within fifteen minutes.. It is PERFECT! Very cute and well crafted.